Private commission. Gouache and acrylic paint on gesso wood panel. 24" x 56"
Siona Benjamin is an award winner painter. Her work reflects her background of being brought up Jewish in India and America. Making a mosaic inspired by both Indian miniature paintings and Sephardic icons. I enjoy working with interior designers or architects to help design a beautiful home, for their clients. I can make this kind of art, thus bringing a focal point to the walls in the home and marrying it to the rest of the decor, to make good harmony and positive atmosphere. 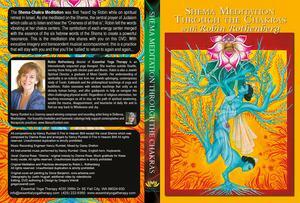 Shema Meditation Through the Chakras DVD Cover Art for Robin Rothenberg, founder of Essential Yoga Therapy"
I will create compelling unique art for the print media such as DVD covers, or Brochures. This type of media illustration will allow more eyeballs to your materials and thus bringing more sales. Siona Benjamin is a painter originally from Bombay, now living in the US. Her work reflects her background of being brought up Jewish in India. In her paintings she combines the imagery of her past with the role she plays in America today, making a mosaic inspired by both Indian miniature paintings and Sephardic icons. She has her first MFA in painting and a second MFA in Theater set design. She has exhibited in the US, Europe and Asia. She has been recently awarded a Fulbright Fellowship in 2010-11 for art project titled: Faces: Weaving Indian Jewish Narratives. Her work has been featured in: The New York Times, The Chicago Tribune, The Philadelphia Inquirer, The Financial Times, The Jewish Week in NYC and NJ, The Boston Globe, Art in America, Art New England, Art and Antiques, ArtNews, Moment magazine, The Times of India, Mumbai Mirror, Midday Newspaper, Caravan magazine and several news papers, magazines, journals and books. SIONA IS AVAILABLE TO MAKE ART, MURALS AND INSTALLATIONS FOR PUBLIC AND PRIVATE SPACES ON COMMISSION BASIS. VISIT WEBSITE FOR MORE DETAILS AND INFORMATION ON WEARABLE ART.